The intricate floral pattern for Primavera, inspired by the paintings of Gustav Klimt, took Larsen and freelance artist Don Wight more than a year to perfect. With so much going on – exuberant clusters of small flower heads, shadowy leaves, and pulsing biomorphic shapes, all scattered freely against a ground of wavy stripes – the pattern had to be just right. And it had to be printed on a fabric that would show it to best advantage. Sensuous velvet was the ideal medium for Primavera’s rich, intoxicating design. But in the late 1950s, it was almost impossible to screen print complex patterns on traditional velvets. The dye could not penetrate the thick pile. Larsen the weaver was not deterred. After extensive experimentation, his studio successfully wove a cotton velvet, luxurious to the touch, with a pile low enough to take the hand screen print dye with no loss of color intensity, a first in the American textile industry. Primavera was introduced as part of Larsen’s Palette ’61 collection with deeply saturated hues, in a variety of exotic colorways. Primavera’s energetic composition and colors worked well for furnishings in open, airy modern interiors and was perfect for the freewheeling, exuberant residential market of the sixties. As a reviewer in Industrial Design noted: “It is not easy to be rampantly luxuriant and succeed; [Primavera] does.” In fact, in its day, Primavera was the most successful printed velvet in the industry. Today it remains an icon of the period. Jack Lenor Larsen, quoted in David McFadden, et al, Jack Lenor Larsen: Creator and Collector (London: Merrell Publishers, 2004), 177. “Annual Design Review,” Industrial Design 8, no. 12 (December 1961), 72. 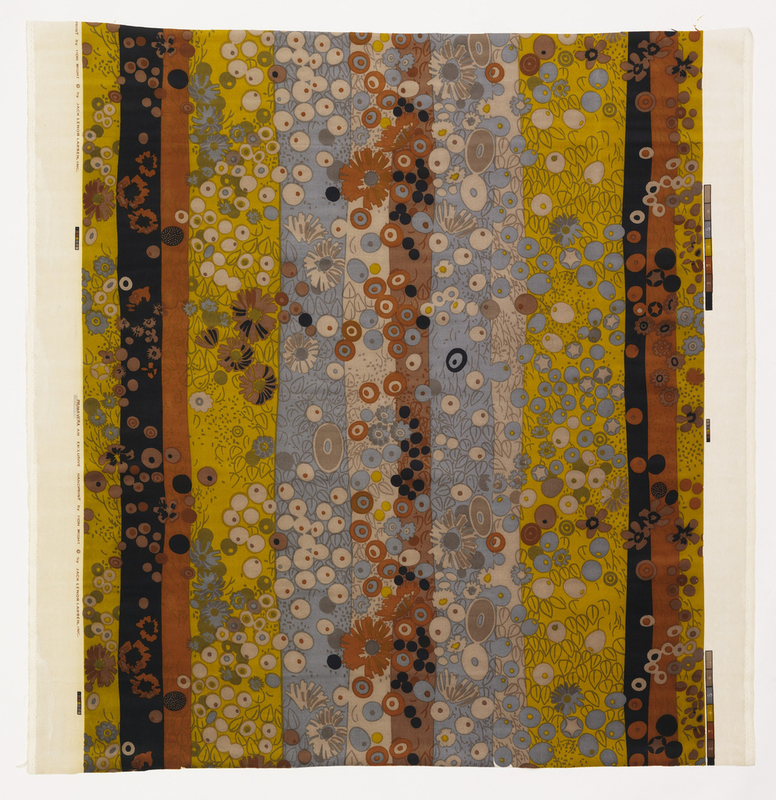 Textile: "Primavera," 1959, New York, USA, designed by Larsen Design Studio and Don Wight, hand screen printed cotton velvet, Gift of Jack Lenor Larsen, 1973-54-2.